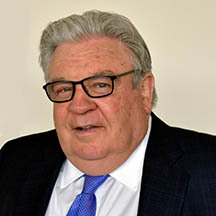 President James Boland, a member of the Executive Board since 1995, became President in 2010, was elected to a five-year term in September 2010 and was re-elected in September 2015. Boland began his tenure on the Board as an Executive Vice President, and from 1999 to 2010, served as Secretary-Treasurer. After becoming a BAC member in 1977, Boland spent the next decade working on commercial projects in the San Francisco Bay area in brick, block, stone, and marble. He became Business Agent in 1988 and then President in 1992 of BAC Local 3 California. One year later he was appointed to serve as a member of the International Union’s highest advisory body, the BAC Executive Council. In 1994 Boland was named to the International Union’s headquarters staff as Assistant to the Vice President for Operations overseeing trade jurisdiction matters. Later that year, he was asked to take on the added field responsibilities of BAC Regional Director for California and Nevada, a position he held until his election to the Executive Board in 1995. As International Union President, Boland's responsibilities include formulating and supervising the IU's programs and activities consistent with the policies established by the IU Convention and in accordance with the Union's Constitution. He is a Vice President of the AFL-CIO Executive Council, Chair of the Council’s Immigration Committee and a member of its International Affairs, and Legislation/Policy, and Political Committees and the newly established Labor Commission on Racial and Economic Justice. He is a member of the Governing Board of Presidents of the North America’s Building Trades Unions. In addition, he serves on the General Presidents’ Committee on Contract Maintenance and the National Joint Heavy and Highway Committee. President Boland is an At-Large member of the Democratic National Committee and serves on the Boards of the National Endowment for Democracy (NED), the AFL-CIO Housing Investment Trust, the Union Labor Life Insurance Company, and the BlueGreen Alliance. He is a 1996 graduate of the Harvard Trade Union Program and attended University College Dublin.